you are trying to attract can sometimes not get a look-in as there is usually a massive squirrel hogging the bird feeder. feeder, therefore, has to be very cleverly designed and also very robust as the squirrels in their clamour to obtain food can break and tear apart the more fragile feeders. Electrified feeders – These give the squirrel a tiny electric shock, deterring their endeavours. Personally, I would avoid these. There are much nicer ways of flummoxing them. A cage within a cage – This set-up speaks for itself. The mesh containing the bird seed is protected from squirrels by an outer cage. A spring-loaded shut-off – The weight of the squirrel closes access to the seed. A feeder with a baffle – A dome-shaped baffle makes it hard for the squirrel to feed. feeding. One drawback is that this can obscure the sight of the birds. The protected inner feeder has 4 ports. The whole apparatus is very heavy duty, weighing over 1 kilo and has a hanging hook for use with feeding stations or you can simply hang it from a tree. Its biocide coating helps to keep it clean and bacteria free. Another safe and humane bird feeder which lets small birds dine but also denies the squirrels a free meal. A squirrel or a large bird trying to access the feed will shut off the feeder port automatically. Both ports have an independent mechanism. A patented ventilation system allows fresh air to enter the tube and humid air to escape keeping the seed fresh. Chew-proof plastic and weather resistant design ensures longevity. There are two perching options with its novel design, drawing a diverse range of bird species. The Squirrel Buster is ideal for use with seeds and blends. 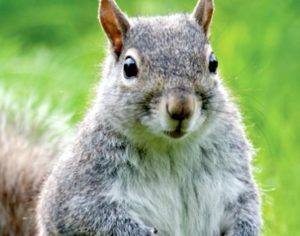 Nearly 2 million Squirrel Busters have been sold worldwide and for extra peace of mind the feeder is backed by a 2-year guarantee. The Chapelwood anti-squirrel peanut feeder is essentially a feeder for small wild birds. This is another example of the main feeder being inside a cage to deter squirrels and larger birds. Some may find that this is less aesthetically pleasing as the bars obscure the birds. The outer cage allows only small birds to reach the inner tube feeder. The whole apparatus is easily taken apart for filling and its flat base inside allows surface-feeding birds to feed. It also has a biocidal coating which kills bacteria on touch. The hanging hook allows it to be used with Chapelwood feeding stations or if preferred it can be hung from a tree branch. Some customers have mentioned that the top lid comes loose too easily. The Roamwild bird feeder stops squirrels large birds and rats from stealing the bird seed from your feathered friends. The clever spring-loaded mechanism ( designed by an ex-Dyson engineer! )is safe and humane. When a large bird or squirrel lands on a perch a hatch moves downwards blocking off access to the bird food. After the large animal has removed itself, the hatch moves upwards giving lighter birds access again to the food. There are 2 feeding ports, each having its own individual mechanism. The design is easy to fill ( not that you will fill it often as it has a 1.5 litre capacity ) and comes apart with ease allowing for easy cleaning. Large birds banging the contraption will not spill much seed as the feeder boasts a non-spill lip feature. Seed ports made of tough 304 grade stainless steel will prevent any chewing or pecking damage and Ultraviolet stabilised plastic will allow the device to shrug off all weather conditions. Keeps feed dry when it rains! The feeder base can be used for any type of food. Hang anywhere in your garden or on a feeder pole. looking at the image above. Its pole height can be adjusted depending on which size of birds you wish to feed and the whole thing can be hung anywhere in the garden by the large hook. One of the main reasons people give for buying this feeder is its aesthetic appeal – it just looks good! 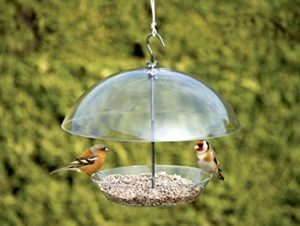 The bird feed should keep dry with the covering dome and the whole thing is moulded in strong clear polycarbonate material making it totally weather resistant to give years of service to your feathered friends. One criticism some purchasers make is that the large hook design makes it easy for it to fall off in high winds, but this can be remedied by the judicious use of string to tie it securely. The Tom Chambers squirrel proof fat ball feeder is another example of a squirrel deterrent that encloses the feeder inside another impenetrable ( for squirrels and larger birds ) cage. The inner feeder can be filled with fat balls. Again, these types of feeder can obscure the sight of small wild birds and if this bothers you, you could always use a conventional fat ball feeder on a squirrel proof station fitted with a dome. As usual from Tom Chambers, this product is robust and the metal is of a sufficiently high gauge metal that squirrels simply cannot bite through. To refill the food holder, you simply undo three clips and drop the holder. The clips are a little fiddly but frequent use makes it a simple task to refill.